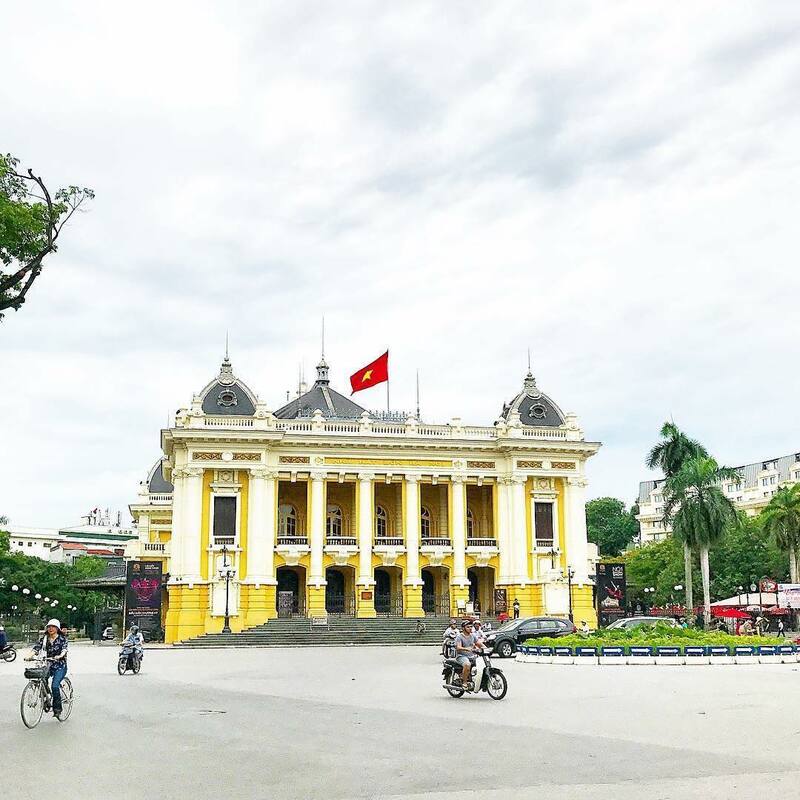 Visiting Hanoi but short on time? Let me walk you through the map of Hanoi. Here you can find a walking guide around the most attractive locations in the Old Quarter. The tour takes approximately 3-4 hours depending on your walking speed and number of photos you want to take. Start our walking tour at The Opera House (marked as the star on the map), located at number 1 Trang Tien Street. This monument was constructed by the French colonial administration in the early 20th century, following the model of Opéra Garnier in Paris, but to a smaller scale and with materials more appropriate and suitable to the local climate conditions. The work of the two architects Harlay and Broyer sought to resemble the many theaters in Europe, particularly those of Southern France, in the early 20th century. After that make your way onto Ton Dan street, located just behind the Opera House, head north and turn left on Le Lai street. After a massive intersection, where you can see the State Bank of Vietnam, you will reach the Ly Thai To Flower Garden (number 2 on the map). This place is home to the statue of King Ly Thai To, a work to honor the king of the Ly Dynasty who established the Thang Long Citadel over a thousand years ago. You might be able to see a host of local people dressed in sport clothes exercising in the background near the garden to 90s dance music, especially in the late afternoon or early morning. Exit the Ly Thai To Flower Garden and you’ll notice a big tranquil lake just to the west. 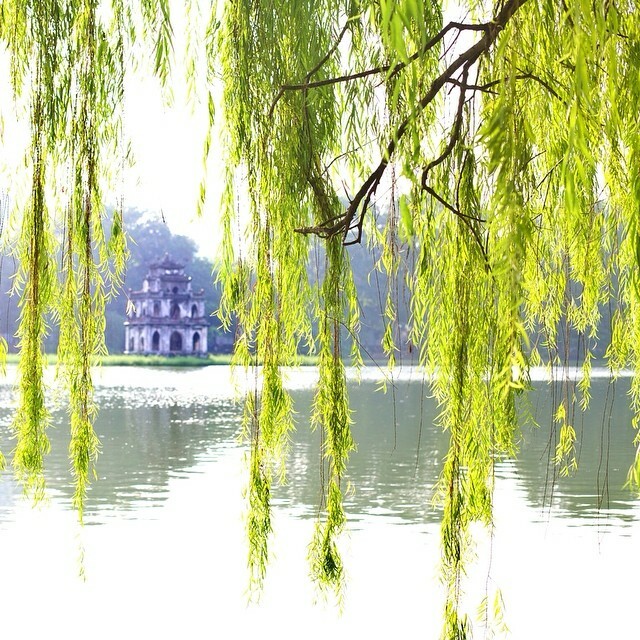 Emanating a sense of peace, Hoan Kiem Lake, is the home of the famous “Turtle Tower and a major focal point into Hanoi’s public life. Legends say that there is a magical turtle that assisted a national hero in the revolutionary war in the 1400s. Whether it is true or not, the lake was a habitat for large soft-shell turtles until only recently. Unfortunately, the last known turtle passed away in 2016. The roads surrounding the lake have since become a giant pedestrian area during weekends. On the North side of the lake, The Pen Tower – The Huc Bridge – Ngoc Son Temple (point number 3) stands tall. Be sure to enter from the bridge on the Northeast side of the lake! This monument is culturally significant in celebrating its Confucian roots. On Lunar New Year’s eve, local people often gather here to watch the fireworks and give good wishes as they enter the new year.If you get the chance to enter Ngoc Son Temple, you can even enjoy a more tranquil view of the lake. However, this does come with a small fee, and hordes of tourists inside during peak seasons. Crossing the bridge and taking photos from this vantage point comes without cost. After the temple, let’s take some time to explore the rest of the Old Quarter. 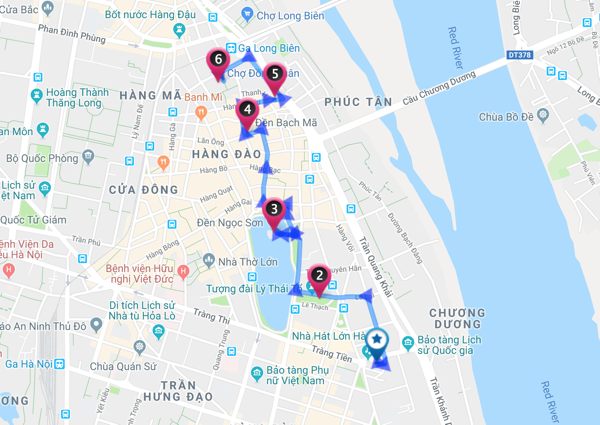 There are a number of activities to do in this area (we might need a separate post for this), but if you are short on time, take a walk through Dinh Liet street. You will find plenty of shops and restaurants along the street. If you are a big fan of “pho”, you might want to drop by “Pho Suong”, which is a traditional pho restaurant in Ngo Trung Yen, a small alley connected to Dinh Liet street. However, they only serve pho in the morning so you might want to get there early to beat the rush. 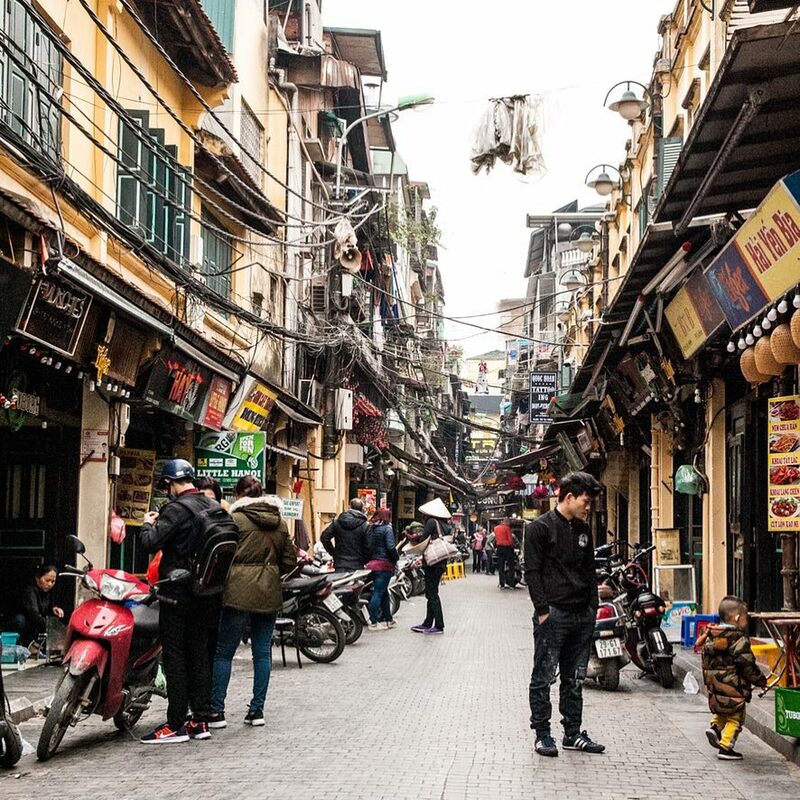 If you continue your journey along Dinh Liet street, you will find the “Western Street”, where many bars and beer clubs are serving locals and foreign visitors. Plan to visit this area after sundown, that’s when you’ll get to see the crowds at play. It’s also worth noting that this area is among the last places to close up shop, staying awake and lively until midnight. At the end of Dinh Liet street, turn left on Hang Buom street and in 20 meters you’ll see Bach Ma Temple (number 4 on the map). This temple is known as one of the four holy guardian houses of the ancient city, protecting the eastern side of the capital. After you exit the temple, continue North onto Hang Giay street and walk two blocks.Turn right on Hang Chieu and continue walking until you see O Quan Chuong Gate, the only Gate of Thang Long citadel left remaining to this day (number 5). Two centuries ago, the area from the gate outwards was considered “suburban”. Now the gate only serves as a place of historical interest. Exit the traditional city centre via the gate, and turn left onto the next big street. Along Yen Phu street, you’ll pass by the Hanoi Ceramic Mosaic Mural on your right hand side. Nearly a meter tall stretching for nearly seven kilometers, this mural features art styles from different dynasties within Vietnam’s history all spanning across the walls of the Red River dyke system. 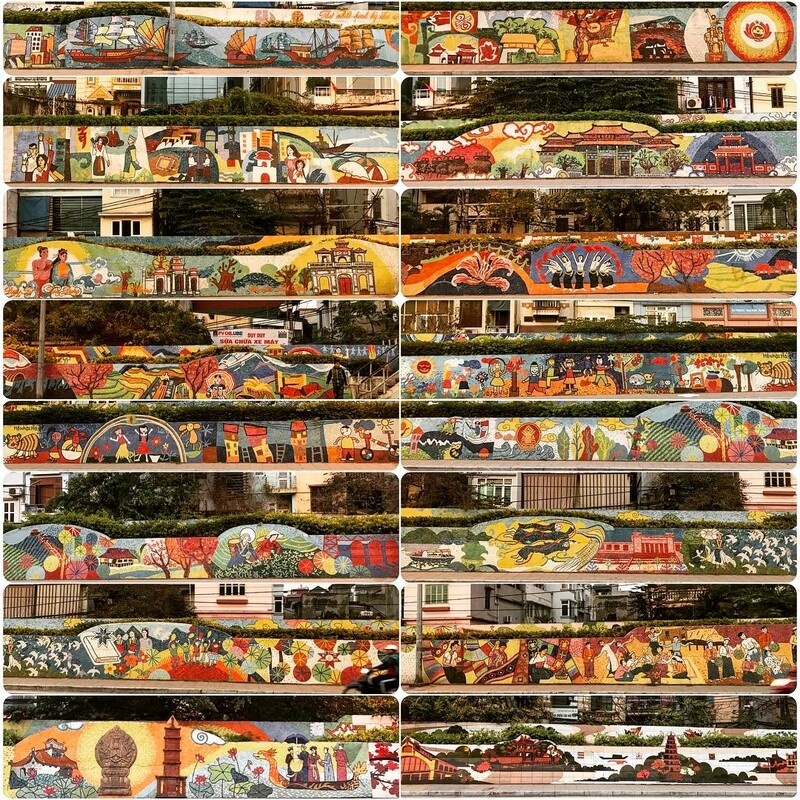 The mural itself has also recently been awarded a Guinness World Record for world’s largest ceramic mosaic! Continue northbound along the big road, and turn left when you reach Hang Khoai street. 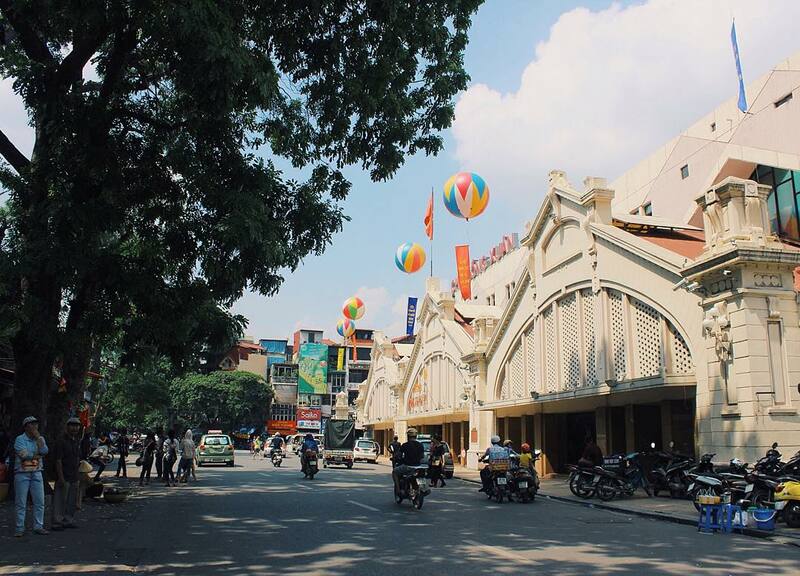 Walk a few blocks and you’ll come across Dong Xuan Market, which is one of the largest markets in Vietnam and the largest market in Hanoi’s Old Quarter (number 6 on the map). The market has existed for hundreds of years since the Nguyen dynasty. You might be able to find some souvenirs for friends or stop for a bowl of noodle soup here. One popular local dishes you might want to look for is “chao suon” (podridge) along with some “quay” (youtiao – a kind of Oriental churros). As we mentioned earlier this walking guide should take you between 3 and 4 hours to complete! It’ll take you through a historical journey through Hanoi’s Old Quarter to see a combination of art, history, and daily life that have centuries under their belt! 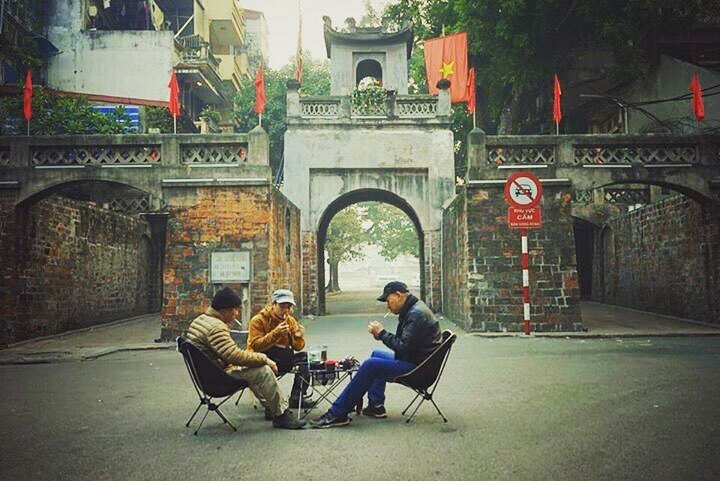 Allow yourself to be transported through time as you enjoy the likes of the Bach Ma Temple, or walk through the O Quan Chuong Gate, while having all the luxury comfort or modern day food and beverages to refresh you along the way!